All things nice grow in your vegetable patch and more than fill your five a day. Succession sowing will see you stocked with veg right through to autumn and beyond. What a list it is! Carrots, turnips, beetroot, spinach, radishes, Brussels sprouts, peas, parsnips, broad beans, leeks, broccoli, summer cabbage, cauliflower and lettuce. That should keep you going for a bit but if you want to spice up your life even more why not grow some chillis indoors to start them off? A few seeds in compost and you’re away. Grow them on and they will be ready to plant out in May or when the frosts have passed. They can be mild, hot or positively volcanic and a good excuse to go wild and international with your cuisine. But why stop there? What about all those lovely herbs you could be growing and harvesting just outside your back door? Other jobs to be done will include keeping those weeds at bay between your vegetable rows. 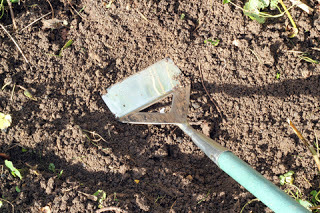 Out with the hoe and once more, into the vegetable plot. Well, someone has to do it.